It’s the last day of August today, which to me is the last day of summer. I spent three hours doing the jobs that I’ve been putting off for a few weeks whilst the weather has been so miserable – namely, weeding. Sodding weeds. They get everywhere. Fat hen, thistle, grass, butter-cup, loads more that I can’t identify…we have them all and they are virulent. The violas which I grew from seed back in March have come up, now exhausted after their long season of colour. And the foxgloves have gone in, to hopefully acclimatise for next summer. The best solution for weeds is total ground cover – just starve them out. The squash are doing an excellent job of that, only 10 weeks old and already threatening to take over the entire neighbourhood. These are Turks Turban and I’m hoping that they get sufficiently gnarled and weird-looking in time for Halloween. 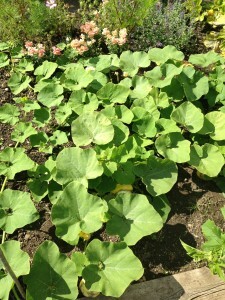 There are 9 plants, and around 3 fruit per plant….that’s a lot of squash. Only one of the fennel seeds I planted a couple of weeks ago has made it up. I think it’s the bit of land they were planted on – we only had one successful carrot from that patch too. Not much you can do with only one carrot. However I think this little seedling needs saving and so it got its own little covering to stop it being gobbled by the pigeons. 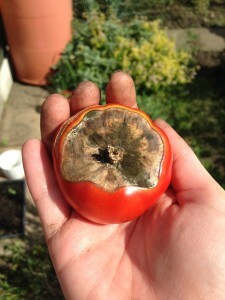 Issue 1: Blossom-end rot. I thought I’d got rid of all these but obviously not. You could stick your finger in this brown patch and it would come out covered in gunk. Issue 2: Scarring. I think this is due to the variety but not sure…it could just be another example of being High Maintenance. Issue 3: Splitting. Apparently this is something to do with heat and/or water. Also known as Definitely Being High Maintenance. I don’t think there’s much I can do now about the first three issues, but I can the last one. The creature in question left a trail of poo which led me to discover its identity (caterpillar) and hiding den (under a leaf). It got chucked onto next door’s strawberries (is that bad?) to survive another day in the Palace of Pigeons. The culprit. That’s a lot of poo for something so small. But on the bright side, we’re not far off a hop harvest. Matt’s threatening to put these in the freezer (he’ll be lucky, there’s no room what with all the raspberries) but I think they’d make a good kitchen decoration. God only knows if they will actually ever get turned into beer. 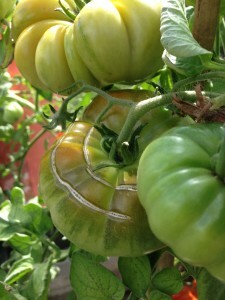 This entry was posted in Allotment, Summer and tagged fennel, Hops, Tomatoes, Turks turban, Weeds. Bookmark the permalink.